TOKYO, Jan 18, 2019 - (JCN Newswire) - Fujitsu Limited today announced that it has received the Energy Conservation Grand Prize for 2018 in the Product and Business Model category of the Agency of Natural Resources and Energy Director-General's Awards for the first time. The prize was awarded for the Fujitsu Server PRIMERGY Immersion Cooling System, which provides revolutionary energy savings, and recognizes the Immersion Cooling System as not just an ICT device, but an advanced energy saving system that reduces power consumption for entire datacenters. Fujitsu developed the Immersion Cooling System by working to commercialize new cooling systems, aiming to provide a comprehensive energy-saving solution that takes into account both ICT devices and datacenter facilities as a unified whole. 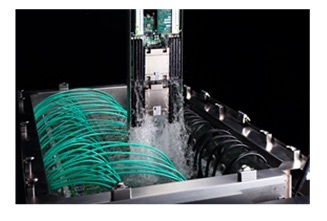 Through such developments as supercomputers, the company has cultivated the i liquid cooling technology over many years. This award recognizes that this product contributes to energy savings while providing the high usability demanded in datacenter operations. This product is a cooling system designed to efficiently and evenly cool servers by immersing them entirely in a cooling liquid. The system provides significant energy savings because it doesn't disperse the heat generated by the servers into the room, which not only renders air conditioning unnecessary, but also eliminates the need for cooling fans installed on the servers themselves. Due to these factors, the system reduces the overall power consumption of a server system, including cooling equipment, by about 40%(1) compared to air cooled systems, contributing to a reduction in CO2 emissions. Moreover, the system can more or less double server installation density in terms of installation space(2), also contributing to reduced TCO(3). Evaluated with a server system consisting of 96 PRIMERGY CX2560 M4 multi-node servers, comparing the power consumption of an air conditioning system and internal server fans against an immersion cooling version with the same configuration. Because the reduction effect depends on the installation environment, Fujitsu does not guarantee a power consumption reduction value in customer environments. Evaluated with a server system consisting of 80 PRIMERGY CX2560 M4 multi-node servers, with 4 rack units required with air cooling that can be reduced to 2 immersion baths with the liquid immersion cooling method. 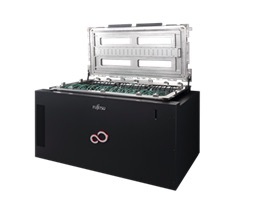 Because the improvement depends on the installation environment, Fujitsu does not guarantee a degree of server density in customer environments. Total cost of ownership. Includes the costs to deploy, operate and maintain the system.